Cell-Mate3D™ matrix is comprised of 2 main components: Hyaluronic acid (HA) and Chitosan (CT). HA is a linear polysaccharide found in the extracellular matrix (ECM) during embryonic development and wound healing. CT, derived from Chitin (deacetylated amines), is a positively charged polysaccharide that is found in the exoskeleton of crustaceans. Both HA and CT are natural occurring, biocompatible, polymers that have been used separately in many biomedical applications. How does the Cell-Mate3D™ gel form? When hydrated with Cell-Mate3D hydration fluid containing cells, fibers form through polyelectrolytic complexing between carboxyl groups on the hyaluronic acid and amine groups on the chitosan, giving the matrix its structure. Cells embedded in Cell-Mate3D™ matrix can be cultured in vitro or injected into animal models for in vivo applications. Do I need a cross-linking reagent or exposure to UV light to form the matrix? No! Cell-Mate3D™ is designed to be free of cross-linking reagents and exposure to UV light, which can be harmful to cells and increase set up time. Will the Cell-Mate3D™ gel break down over time? While the Cell-Mate3D™ gel should not dissociate in culture, the material itself may be broken down and metabolized by cells over time, leaving less Cell-Mate3D™ material and more cells, cell secreted ECM, and 3D structure. What is the porosity of the Cell-Mate3D™ gel? Cell-Mate3D™ does not have pores as it is a hydrocolloid. Media diffuses throughout the matrix in less than 2 hours when using an uncut 500μL matrix, and less time when the matrix is cut into smaller, 30μL-50μL pieces. Do I need to use the hydration fluid provided in the kit? Yes. Use of a different hydration fluid will dramatically decrease the volume of your Cell-Mate3D™ gel, and thus the ability of your cells to integrate into the gel. Can I re-use my formatting tool? Yes. Cell-Mate3D™ formatting tools can be autoclaved. Be sure to clean well after use before autoclaving. Are my cells attached to the Cell-Mate3D™ matrix, or each other? Both! The Cell-Mate3D™ gel is designed to promote both cell-cell and cell-matrix interaction within a 3D environment. How many cells should I embed into a Cell-Mate3D™ gel? This should be optimized for each cell type depending on the size of the cells and if cells are single cells or aggregates. The following cell densities may serve as a guide, however, optimization may be needed depending on desired outcomes and downstream applications. Do I need to use a special media with Cell-Mate3D™? No. Culture your Cell-Mate3D™ gel in media that best suits your application. Can I differentiate iPSCs in Cell-Mate3D™? iPSCs can be differentiated to create cerebral organoids using only E8 maintenance media. Importantly, a large number of cells should be embedded into the matrix, about 19 Million for a 500μL gel and about 9.5 Million per 250μL gel. The cells should be embedded as whole colonies and not as single cells. To learn more, please refer to the manuscript Rapid Induction of Cerebral Organoids From Human Induced Pluripotent Stem Cells Using a Chemically Defined Hydrogel and Defined Cell Culture Medium published in Stem Cells Translational Medicine in July 2016. Can I differentiate hMSC cells in Cell-Mate3D™? hMSCs can differentiate to bone and cartilage inside the Cell-Mate3D™ matrix. Embed 9.5 Million cells per 250μL gel or 19 Million cells per 500μL gel and culture in media provided in the StemPro® Chondrogenesis Differentiation Kit (ThermoFisher# A1007101) or StemPro® Osteogenesis Differentiation Kit (ThermoFisher# A1007201). Can I create complex structures or tissue using Cell-Mate3D™? Depending on the cell type used, complex and organized structures have formed both inside the Cell-Mate3D™ matrix and on the surfaces of the matrix. For example, cerebral organoids will emerge out of surfaces of a cell embedded Cell-Mate3D™ matrix. Mammosphere-like structures will emerge out of MCF-7 embedded Cell-Mate3D™ gels and a normal ductal-like tissue will emerge out of MCF-10 embedded Cell-Mate3D™ gels. I’m doing cancer research. How many cells should I embed into Cell-Mate3D™? Cell density should be optimized with each cell type. We recommend 7 – 9.5 Million cells per 250μL gel or 14-19 Million cells per 500μL gel as a starting point and observing for a desired outcome over 7-21 days. The cell population can be adjusted as needed, however, when the cell population is lowered to fewer than 7M cells per 250μL gel or 14M cells per 500μL gel it may be difficult to perform downstream analysis such as microscopy, cell retrieval, RNA isolation, and protein isolation. I have a limited number of cells to use, what would you recommend? When the cell population is lowered to fewer than 7M cells per 250μL gel or 14M cells per 500μL gel it may be difficult to perform downstream analysis such as microscopy, cell retrieval, RNA isolation and protein isolation. However, if you have a fast growing cell population, it may be possible to add fewer cells initially and allow the cells to populate the matrix over time. What cells are viable in Cell-Mate3D™? How can I create 3D co-cultures using Cell-Mate3D™? To achieve a co-culture, you may culture cells together in a flask and incubate for 24 hours before harvesting and embedding into the matrix. Alternatively, simply mix desired cells in media and spin down together into one pellet. Resuspend the pellet containing both cell populations in the appropriate volume of hydration fluid and embed in the Cell-Mate3D™ matrix according to the Cell-Mate3D™ Technical Data Sheet. I have cells that require a specific ECM component. Can I add additional ECM from an existing protocol into the Cell-Mate3D™ matrix? Yes, you can replace up to 20% of the hydration fluid with your ECM component. However, mechanical properties of the construct may change, leading to a softer product. Also, please be mindful of the pH of any ECM that is added to the Cell-Mate3D™ matrix to ensure that near-physiologic conditions are provided to cells. Should I add the total volume of cells + hydration fluid to the dry blend or only the specified amount? Only add the specified amount. For the 250μL kit, use only 250μL of hydration fluid + cells and for the 500μL kit, use only 500μL of hydration fluid + cells. Adding extra liquid volume to the dry blend can lead to a softer matrix. How do I transfer the gel from the formatting tool to a syringe for injection? Once the gel is spun down in the formatting tool, remove the funnel and push the gel all the way to the edge. 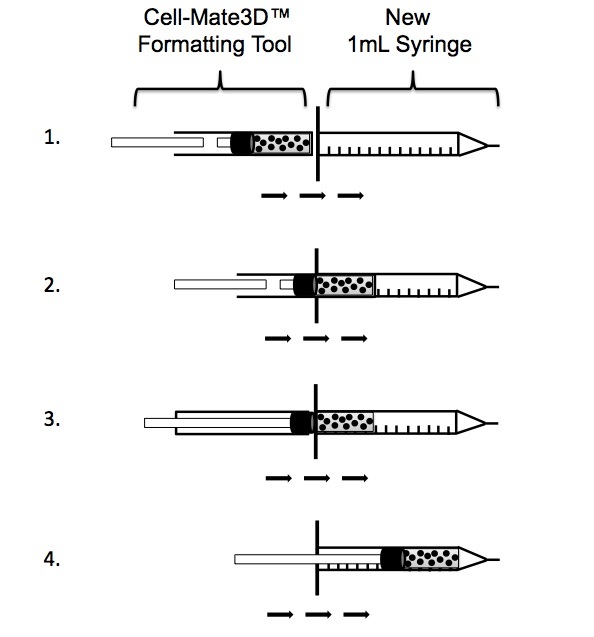 Before proceeding, be sure that your syringe is the same diameter as the formatting tool. Remove the plunger from the new syringe and align the formatting tool with the opening of the syringe. The barrels should touch so there are not gaps. Push the gel into the syringe using the long plunger that is supplied with the Cell-Mate3D™ kit. Push the gel in only to the point where the gel has just fully entered the syringe. Put down the small and large plungers that came with the kit and pick up the new syringe plunger that came with the new syringe. Using the new plunger that came with the syringe, push the gel all of the way into the syringe. Cap the syringe with a short needle. We recommend no higher than a 23G needle (18G-23G works well). Will I lose any gel during injection, if so, how much? Yes. Typically, 50μL will be lost in the hub of the needle. A short needle is desired. Use of a longer needle may result in loss of additional material. What size needle is recommend for injection? Is Cell-Mate3D biocompatible for animal models? Cell-Mate3D is biocompatible. It does not illicit an immune response when injected into mice subcutaneously, intramuscularly, or under the kidney capsule. I am seeing autofluorescence and background staining with my Cell-Mate3D™ sample. Is there a way to minimize this? Yes. We recommend using inverted confocal microscopy to image samples. In addition, use of specific blocking agents, longer washes, antibody titrations, and optimization of staining time may be necessary. See our optimized staining and imaging protocols here. What microscopy techniques work best with Cell-Mate3D™? We recommend using inverted confocal microscopy because it enables one to collect serial optical sections from thick Cell-Mate3D™ samples. See our optimized staining and imaging protocols here. What stains and protocols have been tested with Cell-Mate3D™? Nucleus-NucBlue (Fixed Cell or Live) ReadyProbes Reagent. Plasma Membrane-CellMask™ Deep Red Plasma Membrane Stain. Lipids-HCS Lipid Tox™ Deep Red Neutral Lipid Stain. For details, see our Whole Matrix Staining & Confocal Microscopy Protocol and our Cryosectioning and Staining protocol. LIVE/DEAD, NucBlue, ReadyProbes, Alexa Fluor, CellMask, Lipid Tox, MitoTracker are registered trademarks of Thermo Fisher Scientific. Are Cell Mate3D™ cultures suitable for immunofluorescence? Immunofluorescence staining works well when imaged using confocal microscopy. For details, see our Whole Matrix Staining & Confocal Microscopy Protocol and our Cryosectioning and Staining protocol. Are Cell Mate3D™ cultures suitable for histology? Cell-Mate3D™ can generally be treated like tissue and can undergo cryosectioning and staining, Formalin Fixed Paraffin Embedding (FFPE) and staining, and electron microscopy. In addition, whole pieces of 3D cultures can be stained live or fixed, and can be analyzed using inverted confocal microscopy. See our detailed protocols for more information. Can RNA be isolated from Cell-Mate3D™ cultures for RT-PCR? Total RNA can be isolated from Cell-Mate3D™ cultures using the Cell-Mate3D™ RNA Isolation Kit. Additional cleanup, such as a Qiagen® Cleanup Kit is recommended before performing RT-PCR or qRT-PCR. Qiagen is a registered trademark of Qiagen N.V.
Can protein be isolated from Cell-Mate3D? Yes. Protein can be isolated directly from the matrix using BRTI’s protein isolation protocol. If desired, protein can also be isolated from cells after recovering them from the matrix using BRTI’s Cell Retrieval Kit. Can I retrieve cells from my Cell Mate3D™ culture for downstream experiments such as flow cytometry? Yes. BRTI offers an enzyme-based cell retrieval kit available for purchase here. Once cells are isolated from the matrix, they can be stained and analyzed by flow cytometry using standard methods. Can I flatten the Cell-Mate3D™ matrix on the bottom of a cell culture plate? A cell embedded Cell-Mate3D™ gel can be flattened to the bottom of a plate. See our Matrix Immobilization: Plate Bottom Protocol for details.